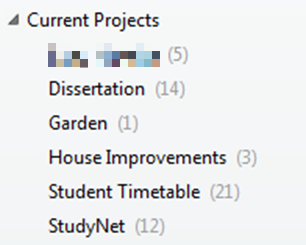 Work has changed for me slightly over the past few years, and I’ve moved into the world of Project Management. I’ve however got a chance again now to get my hands ‘dirty’ with some .NET coding – its been a few year since I’ve done any in anger – so I’m trying to gain a refresh into the current platform and its technology. Expect a few .NET 101 posts to follow this one. We’re looking significantly to adopt .NET Core as we’ve got a great greenfield project on the horizon. However much of our infrastructure is based on Oracle and without a .NET Core supported route, I think we might have to fall back to .NET Framework 4.6.X, at least in the short term. This blog post is to look at how .NET apps can connect to, specifically, Oracle Databases. 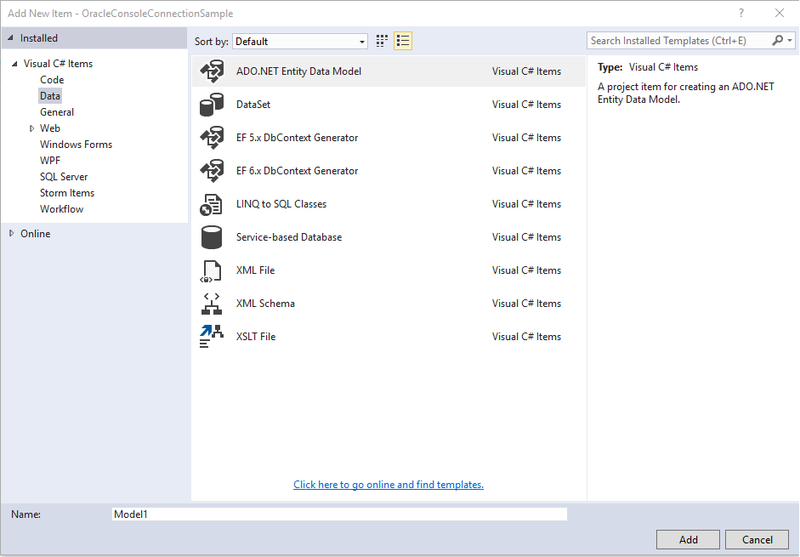 You need to install Oracle Data Access Components (ODAC) with Developer Tools for Visual Studio (from here). Extract the zip, and click setup.exe and follow the defaults. 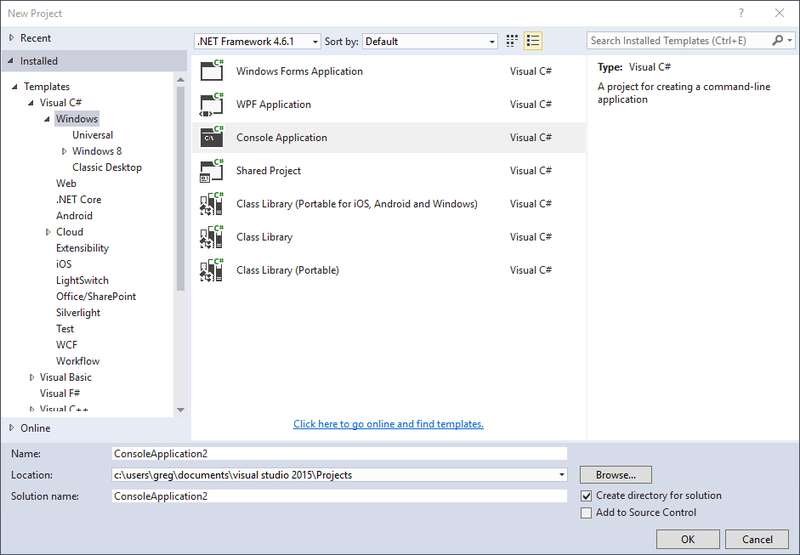 Open Visual Studio 2015, and click File->New->Project. Then select Visual C#->Windows and Console Application, confirming that .NET Framework 4.6.1 is selected from the drop-down menu. Click Browse from the top menu bar, and then search from EntityFramework by Microsoft (its likely to be listed near the top anywhere). Select and install. Then search for ODP and install the ‘Oracle.ManagedDataAccess.EntityFramework’ by Oracle. To create a new Connection I’ve found adding the details the installed tnsnames.ora file to be the best way – I’m not in a position to share mine, but there should be examples out there on the Internet. Select the appropriate connection, enter the username and password and click Next. I then select all the tables that are available in the database. Click Finish. This will generate a number of files, that should relate primarily to the tables you’ve selected. 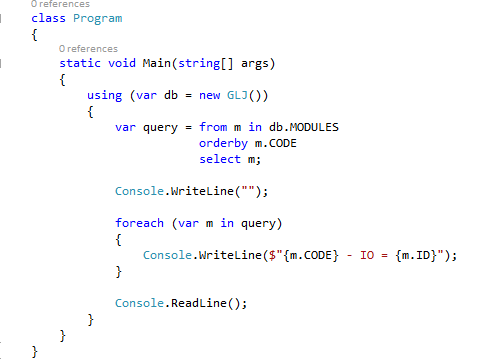 Then enter the following code into your program (note, the name of the database may alter depending on what you enter in the ADO.NET file – I think it defaults to Model – my example below uses GLJ). The syntax for the query you’re running may also alter depending on your data columns. Running this provides a list of modules that we have stored in a test database from Oracle. I’m really not expecting this to work – I’m not aware of any announcement about Oracle and .NET Core support at this time – certainly my Google searches haven’t been that fruitful. The closest I’ve got is this discussion on the OTN. And looking back over the @OracleDotNet twitter feed I can’t see anything having been announced. Anyway, back to Visual Studio 2015 and this time New->Project. And then Visual C#->.NET Core and Console Application (.NET Core). Then using NuGet to add the 2 packages as per the previous guide for a standard Console App – even trying to add the Microsoft EntityFramework at this time produces a compiler error. However I can search for ‘Microsoft.EntityFrameworkCore’ and I get a library that seems to be fine. Trying to install the Oracle ODP Framework though gives the expected compiler issue. At this point its probably worth abandoning this attempt. So for this attempt I’m going to try a web application because something that interests me (but I haven’t yet got my head round) is the 3 option listed for ASP.NET Core Web Application (.NET Framework). I select Web Application to get something running quickly. 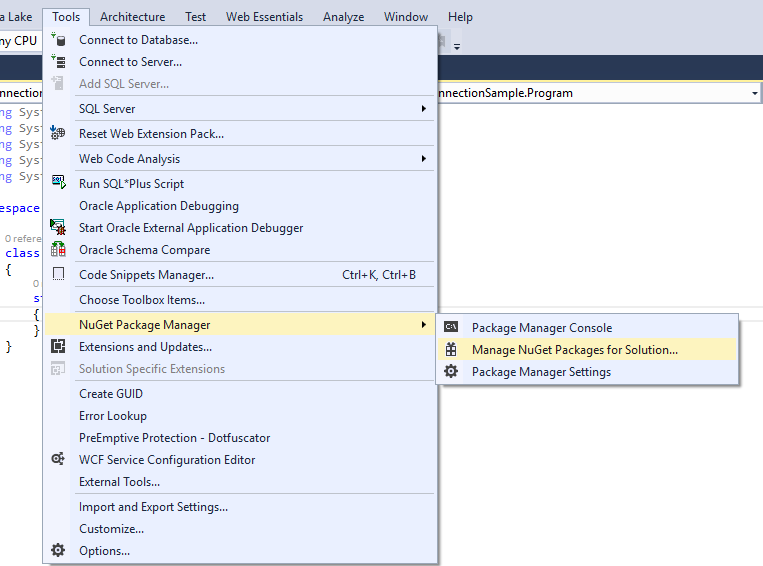 I then added the Microsoft Entity Framework Core Library, via NuGet as mentioned in Step 2. I then also added the ODP Oracle Entity Framework (as mentioned in Step 1, this time without issue). However clicking into Add New Item – the Data option previously used isn’t on show. 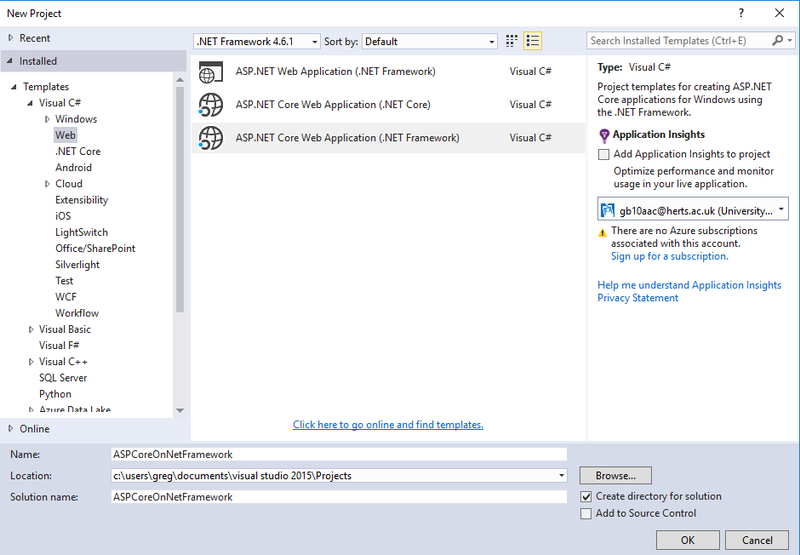 Switching to create a New ASP.NET MVC application on the .NET Framework and following the steps above (but using Entity Framework rather than the dotnet core version) does produce the option to have a Data object added – and following the steps detailed in Stage 1 seems to work. The next step I guess for this would be to try the dotnet core options with a MS SQL Server database and see what the support is like. However, it looks like we’ll still be on .NET 4.6.X until some Oracle DB support comes to dotnet core. A little bit late to the party with this one. I’ve been keeping up-to-date with Java 8 (and 9) changes, but our enterprise servers tend to not to be updated early on (understandably). However, Oracle ran a Java 8 MOOC recently (they’ve since made the videos available via YouTube). I’m particularly interested in the parallel streams as we have a long running process that may benefit from the new syntax. Takes approximately 469 ms to run. This comes down to 272 ms.
As I say, unscientific and a very simple use case. Be interesting to see what happens in the real world though. 3. A final process to concatenate 2 fields in the database after the insert has completed. Step 3 is an unnecessary overhead that was introduced a while back. Steps 1 or 2 are the better areas for this fix to be implemented. Having never used SQL Loader it looked a more interesting learning experience, and heres some quick findings. To read the value into a temporary store, use the BOUNDFILLER key word (apparently supported in Oracle 9+). However, with our implementation, then continue to process the columns in order, before finally coming back to insert the temp values into their relevant columns. Found plenty of examples on the Internet, but few made reference to the fields needing to be the final ones inserted. Baldock Beast. Its a local half marathon, virtually on my door-step. The 3rd running of the event happened last weekend (15/2). And I recorded my third DNS (Did Not Start). 2013 – My wife was pregnant, but it was prior to scans so no-one knew. My running buddy had just become a dad, and his son had a bout of measles. Measles and pregnant ladies don’t mix. I couldn’t think of a way to explain not wanting to run with my mate, and with a slight hint of a cold decided to pull the ‘flu flag’. DNS 1. 2014 – I headed into London for a Cage The Elephant / Foals gig. By 6pm the beers and shots were flowing, and I knew I’d be in no fit state the next day. I wasn’t. I may have sobered up by the Monday. Just. DNS 2. 2015 – I’ve been slightly limping for a year of so. My right knee. It hasn’t interfered with training, but 2 people this year have asked if I was injured – when I felt fine (I think I’d got use to the limp). On the Thursday before this years race I heard those dreaded words from a physio – ‘I’d advise you don’t run’. DNS 3. I’ll be entering again next year. Lets hope I make the start line this time round. PS. Knee is nothing too much to worry about. A tight tendon that needs loosen off, a slight alteration to my running style and perhaps a change of trainers. Latest diagnosis was for about 6-8 weeks off. In better news I can continue to cycle and swim. No Crossfit for the time being either though. A team member was struggling to get this working recently, and noted that the examples he encountered on the Internet didn’t seem to be correct. Heres the ‘working’ example that we have put in place – open to feedback if something silly is being done. As part of the latest Java EE release (version 7), the JMS component has been reviewed and revamped. I was recently fortunate enough to attend the inaugural London GlassFish Users Group earlier this week where Nigel Deakin from Oracle was presenting the latest features and developments. This blog post is really to expand my knowledge, test some of the things mentioned, and to act as reference to my future self. All examples in this blog post are going to be using GlassFish 4.0 and NetBeans 7.3. First of all start the GlassFish server, and then log into the Admin Console (localhost:4848). We’re then going to create our Queue and Connection Factory to handle the queue. Thats us got the infrastructure for the queue to function. (I’ve subsequently discovered there is no need for the Connection Factory, GF4 provides a default one that would be used if no others have been created!). Now return to NetBeans and lets create a servlet to send the first message. We’re going to use JMS 1.1 for this example, before then doing JMS 2.0 which will hopefully show some of the simplifications that have been made. 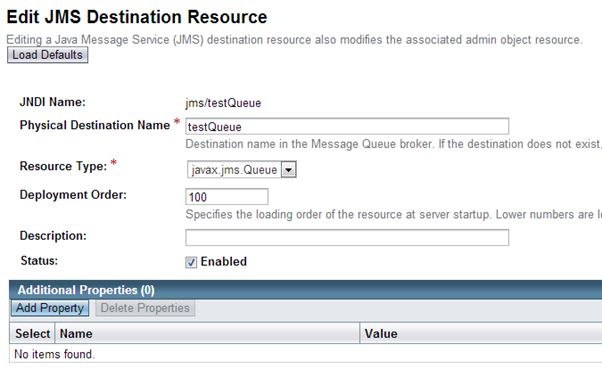 In NetBeans create a new servlet, named something like JMSOne. Then add the following code to the processRequest() method. // The 2 parameters passed here do not make any difference in GF! Run the servlet, and perhaps have some output, either to the screen or to the GlassFish log and your message should send. (How do I know its been sent? Well, this is something that I think is lacking in GF – or I’m missing something simple. I can’t see where you can see the current status of the queue – but I’ll see if I can address this later in this blog post). Now we need to create a message consumer to read the message that we have just sent. NetBeans makes this incredible straight-forward to do by providing most of the code for you. Right click the project and create New->Enterprise Java Beans –> Message Driven Beans and then enter the parameters for the queue that we created previously. So the code previous is straight-forward, but slightly long winded. Admittedly some could be removed with try with resources functionality introduced in JavaEE 7, but still. Now create a new Java Servlet, along the lines of JMSTwo. The code is now down to 2 lines, and 1 of those is to declare the data to send. There is no need for the session, connection factory or connection. Everything is taken care of. The code for this a very straight-forward. The time is in milliseconds, so the code below delays sending the message for 60 seconds. Note this doesn’t hold the servlet from continuing. By watching my server.log for the 60 seconds after, we see the text from the message appear. This doesn’t fit well into this blog post – its for use with standalone applications outside of the Java EE Web and EJB containers. It does however allow the application to send a message and then continue processing further steps without the need to wait for a reply. A future blog post may look into standalone applications sending messages. Poison Message Handling really comes into effect when a message is returned to the queue for re-processing for whatever reason. The most obvious example would be when a connection to the database cannot be obtained (e.g. due to network or infrastructure issues). 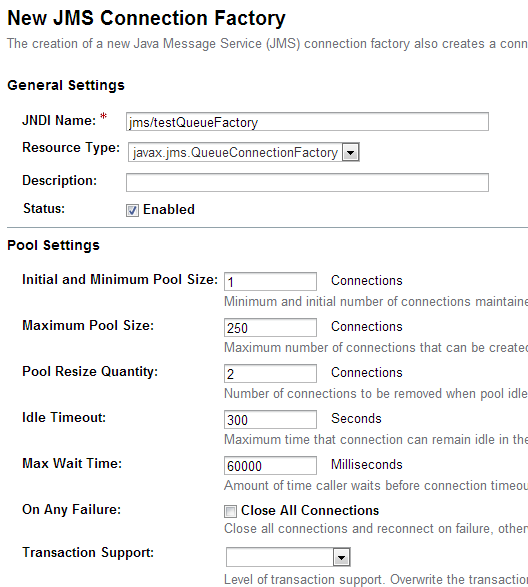 An improvement that has been made in JMS 2.0 is that the number of times a message has been processed can be retrieved. For this we’re going to update the onMessage() received bean. The code below throws a dummy exception to return the message back to the queue. After the 3rd attempt, it writes the message contents to the server.log for later processing. SEVERE: Received this message 1 times. SEVERE: Received this message 2 times. A more suitable use case for myself in this scenario is actually getting the message queue to stop processing messages in this scenario. I’d like then to build up whilst the reason for failure is detected (normally due to it being a networking / database issue). I’ve yet to find something that I’m completely comfortable with, but provided this message doesn’t return, no further messages will be process. So prior to throwing a RuntimeException, I can put in place a Thread.sleep(milliseconds) to sleep for a period of time. This would allow messages to build up. The time to hold the queue for would need to be specific for the scenario being catered for. Ultimately it could be for an hour or so, and then remove the check for the number of times the message has been processed and just allow it to continue re-processing the message. I said earlier that there is no default out-of-the-box monitoring within GlassFish for JMS. Thats not strictly true. Unfortunately (unless I’m missing something?) its not available in the Admin Console. GlassFish does come bundled with a number of command line utilities, one of which being the Admin Manager for MQ. This utility can be found in \glassfish4\mq\bin and launched via imqadmin. You then need to add a broker to localhost (Right-click on Brokers and Add…). The settings should be localhost, 7676, admin and admin (unless you’ve changed your localhost Admin password). 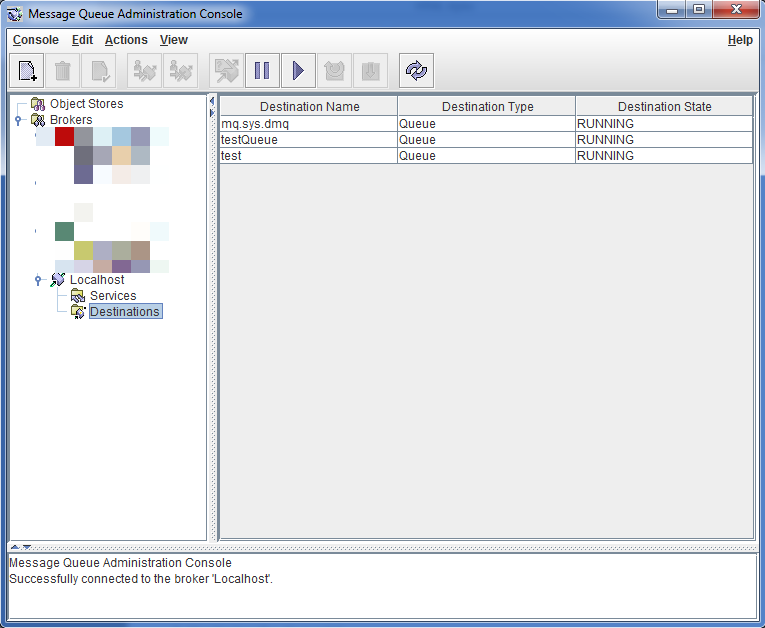 Once added, you can then click the ‘Physical Destinations’ under your broker and the testQueue created earlier will appear. By selecting the queue, and then clicking Properties (either via the Icon on the Toolbar or via Actions-Properties menu). 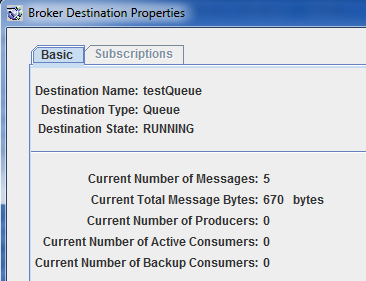 This will show you details about the queue, including the number of messages sitting in it (0 at this stage). 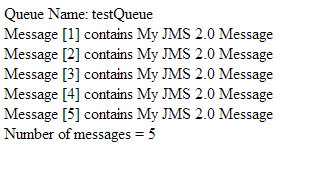 By running the send message servlet 5 times and then restarting the imqadmin client and connecting to localhost and viewing properties for queueTest I can see 5 message waiting in the queue. This all seems quite long winded, so I put together a little servlet that would do something similar, using the QueueBrowser class. The QueueBrowser allows you to peek at the Message Queue without stripping the messages out. I’ve yet to discover a way of listening all the queues on the server, but can’t imagine this would be difficult. Could quite easily create a JSP to ask the user to enter the queue name and then retrieve the messages and count from this servlet with some simple modifications. One benefit from my experience in the MS world of MSMQ is the way messages are safely stored in cash of unexpected system restarts etc. With my 5 messages safely in the queue I’m going to restart GlassFish to see what happens to them. And I’m pleased to say its kept them safe. All in all this has been a whirlwind tour of JMS in general, but with a glance towards some of the new functionality in JMS 2.0. If anything is wrong in this post please let me know – I’m completely acknowledging my ‘learning’ position with regards to this technology. Likewise, if anything is missing that you’d like me to research and cover, please let me know. I’m already looking forward to the next GlassFish Users Group next month. I love Evernote. So much so some of my colleagues are wondering if I’m working on the side as a salesperson for them. Anyway, I saw a tweet in my timeline this morning asking for some tips for usage, so I thought I’d share my set-up and also some tips I gleaned along the way. I did a short post back in March about this topic, but I’ve moved on slightly since then, so this is a much fuller description and its been in place for about 4 months now. 1. Your Evernote account has an email address. Its a a strange mix of characters, presumably representing an underlying unique username in their system. Too difficult to remember at any stage. So add it to your email contacts list and give it a friendlier name. Having my own domain, I’ve even set-up en@mymadeupdomain.com just so others can email me direct to Evernote when in meetings. To get your Evernote email go to Account Settings on the Web, or in the Windows Desktop App – Tools –> Account Settings. There is also a plug-in for Outlook so you can just click a button to add any email to Evernote. Its been a while since I installed it, but a quick Google takes me to this discussion page, which should provide further help. There are also useful annotations that you can add to the subject line to get the email into the right notebook in Evernote. By default it goes into your Inbox/default notebook. You can alter this by (using a @ to change the notebook) or add a tag (adding a #). You can also add reminders this way with an !. I very rarely use these though. For fuller, more precise details see here in this video. 2. The Android Widget. (Probably available on iOS too?). Normally when I’m walking around is when I remember things I need to do. This little widget will allow me to take notes either written, via the camera or an audio recording and send it straight to Evernote. It also records the GPS of where you were – should that be a factor. 3. Camscanner (Android App – iOS?). This is basically a scanner for your phone. It allows you to adjust what you’ve captured and then share via a range of ways, including to Evernote. As another aside, I’ve found this incredibly useful when attending conferences / lectures and taking photos of the presentation slides. A caveat – this is my set-up. It works for me. Its not necessarily the way. Or even the way for you. My framework is based loosely on the GTD principles from David Allen. At the top of my notebook view I have 5 main notebooks – !Inbox, !IncubationIdeas, !Journal, !ToDo, !WaitingFor. You’ll notice the ! marks in front. This is on purpose. It means these will stay above all my other notebooks. These are probably my most used notebooks. Inbox represents things that I’ve captured but not yet processed. Incubation Ideas are ideas for things I’d like to do. At some point. I may not have time now, or the time might not be quite right. Journal is my attempt to capture everything I do in a day. (More on this later). To Do is my main go to area. I have a separate note in here for each of the tasks that I’m aware of need action. 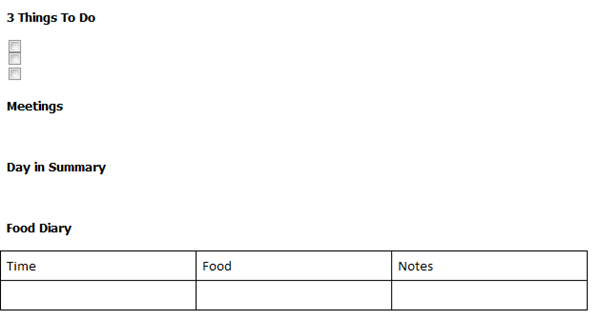 (The title of the note is usually the next possible action and the note itself contains a checkbox (more later)). Waiting For is stuff I’ve delegated but need to have an awareness of. Sticking with the GTD principles I have a list of current projects that are happening in my life – ranging from home personal stuff to work related. Within these I tend to have at least 2 notes – ‘Project Log’ and ‘Project Actions’. Alongside these 2 notes sit anything else I’d like to refer to for future knowledge. Project Log is something I’m experimenting with. Its essentially like a blog where I put date ordered notes about anything that happened, who was involved. It gives me a nice overview of everything that has happened in a project. (I used to keep these as separate notes, but found it a bit unwieldy). Everything else is just for reference – stuff I may want to refer to in future or a way of storing things. This essentially takes a format of a file system – using notebooks as a folder equivalent. Projects that are complete are moved into this area too for archiving / future referencing. This for me is where Evernote comes into its own. The search facility is truly amazing, and was perhaps the part of Evernote that I really didn’t fully appreciate when first starting out. Before really starting work each day I note down the 3 overriding actions I’d like to get completed today – this comes from the principles outlined in Getting Results the Agile Way. I also note down any meetings, bullet point any actions I’ve performed during the day and I attempt to keep a food diary. 3. Tags. I have used. And then I’ve removed. And then I’ve added back. Currently I’m not using them. I can see their benefit but it just adds an extra layer of complexity to my set-up. 4. Subscribe to your blog via Evernote Email. Have your own blog? Then subscribe to it using your Evernote email. That way every time a blog post is made, you’ll have an email back-up copy in your Evernote without having to do anything.